Happy Earth Day! I am SURE you guys have heard of the amazing clothing brand Polarn O. Pyret, right? Right. They're clothes are some of our favorites for kids - colorful, great designs and durable. Love! Well they have teamed up with Thred Up to bring us an amazing program for getting some use out of our clothes that don't get so much use any more. We have a ton of clothing that Elliott doesn't fit into anymore but it still (somehow) still looks great. Instead of hefting it down to Goodwill, get yourself one of these bags! Here's how it works. Sign up to have a bag (or 10) sent to you. Once you get it in the mail, fill it with your gently used clothes then follow the instructions on the bag to mail it back to get STORE CREDIT to get brand new clothes from Polarn O. Pyret! Pretty awesome, right? We tried it out and loved it. Also, we miraculously have so much more space in our dresser! Total bonus. This post was sponsored by Polarn O. Pyret but all opinions are my own. We really do love them! Thank you for supporting the companies that help make And We Play possible. Have you guys heard of Dream Car? It's... a dream. Seriously. This is one beautifully made toy! Each set comes with two tops as you can see and they attach to the gorgeous wood base with embedded magnets. It's so easy to snap in and get playing! Perfect for little hands. The tops are obviously chalkboard, but I have to say this and I don't know if anyone out there feels the same. But not all chalkboards are created equally! Some chalkboard surfaces are rough, uneven and don't write on smoothly. These chalkboard cars are amazing. So easy to draw on and wipe off to recreate something new. I love it! And! The Dream Car comes with a set of colorful chalk and an eraser. Pretty amazing, right? The cars are bigger than I first expected them to be, which to me is fantastic. I debated whether to give this to Elliott and have him model the awesomeness of the cars, but in the end decided to hold off and give these to him for Christmas. If you have a little one who you love dearly and want them to have a gorgeous, one of a kind gift this holiday season, this is a great option. They will love it! And so will you. School is out for the summer in a few days (huzzah!) and we have already started in on the summer fun. Something that I think is vital for an easy and fun summer are shoes. That might sound a little strange, but since Elliott doesn't tie his own shoes yet, having some great shoes for him to put on himself and go out to play in is vital. These shoes look like Chuck Taylors (which we love so much Preston and I wore them on our wedding day) but they are actually from H&M. I have never been a fan of "knock offs" but these were too good to resist. They look just like the real deal and the price tag couldn't be beat so I gave them a shot and we are loving them. They come in a spectrum of great colors which is perfect for a stylish little one. But the absolute best part about these shoes is the laces are elastic! So Elliott can put them on all by himself. Unlike some other elastic shoes, they velcro at the top to stay secure. I love that the elastic looks like laces though. Finally a shoes that is practical, easy and looks great! We really can't say enough great things about them. Oh, Elliott also swears they make him run at cheetah speed. So there's that. To celebrate Children's book week, here is one of our favorite books! We're huge fans of Jon Klassen, so when I saw The Dark I knew we had to have it. Honestly, I didn't even know what the book was about until I read it for the first time with Elliott. It's a great and kind of creepy story about a little boy who is afraid of the dark. It's cute, funny and a little spooky. Elliott has never had much of a problem with the dark, but he still loved the book and loves reading it with me before bed. The illustrations are fantastic, which is at least half of a good kids book, right? Again, we can thank Jon Klassen for that! If your little one has trouble with the dark, this is a great book for them. We love it! As I mentioned before, we recently shared one of our favorite summer activities with Elliott - the drive-inn! We had so much fun. It was great being able to experience it for the first time again through him. We piled every pillow and blanket we own into the trunk and cuddled in for the movie. Being in the trunk with all three of us didn't last all that long, but Elliott took full advantage of it! If you don't know already, you get two movies for the price of one at the drive-inn. The first movie was kid-friendly, and we explained to Elliott that the second movie wasn't for him. He did so good not watching it and playing on our phones and eventually falling asleep. It was like a family night and a date night all wrapped into one! I love seeing all of the other families at the drive-inn piled up in their mini vans with snacks and blankets. The drive-inn is such a nostalgic american past-time. Preston and I both grew up in Florida where it's far too hot to go to the drive-inn in the summer. But here in Utah, it's perfect! As soon as the sun goes down it's nice and cool, perfect for sitting in the car for a few hours. We will definitely be going back this summer. It's too fun not to! I love finding apps that are fun, educational and well designed. It's so rare! Drawnimal meets the requirements. It teaches the alphabet with some pretty adorable animals that prompt you to draw around the phone to complete the design. Genius, right? We love it! It's really easy to use and a lot of fun. And if you don't feel like using up an entire stack of paper, you could laminate a piece of paper and let them use that with some washable dry erase markers. They can draw again and again and your printer will still have paper. The illustrations are so cute. After they draw what is prompted, they can click on the play button for a little animated surprise. It's pretty fun stuff. I hope they continue to come out with more animals for the letters to give a little variety so the kids will keep going through the alphabet again and again. Just a thought! If you don't have it already, we really recommend it. Your kids will love it! It really comes in handy at any moment you need to keep the kiddos occupied. Which we all know is often. Our friends Michelle and Steve from Twig are the husband and wife duo behind the adorable and brilliant wooden toy cameras. This past weekend they hosted an event to launch their new cameras which was amazing. New colors, new styles and the clever viewfinder so the kids can actually see what they are "photographing"! Elliott fell instantly head over heels for the new Instamatic camera. It's inspired by the 60's Kodak camera and it even comes with a color-changing viewfinder. Awesome, right? Elliott has no idea yet, but the Easter bunny will be bringing him one in his basket this year. At the event there were creative stations for the kids to work on a couple of different projects. There was tree stump rubbings, stamping and drawing, cardboard camera coloring and building and we even got a bare wooden camera from Twig to paint ourselves. Elliott chose the color and painted most of it and I might have micromanaged...just a little. All of the kids had a blast going from station to station working on their projects and showing off their skills. Twig also has some incredible children's chairs of which we are huge fans. It was such a fun launch event and we are so excited to have some fun with our new cameras! Thanks, Michelle and Steve for a seriously awesome time. Normally, I wouldn't have Elliott modeling his not yet gifted Christmas pajamas. We usually give a pair on Christmas Eve. But he was sneaky and saw them a few weeks ago and has been bugging me to let him wear them since. That kid. He still can't have them, but he can model them for us! I saw these on Pinterest a little while back and found them on Ebay for super cheap. I'm talking $9 a pair including shipping. How could I resist? Naturally I got two. 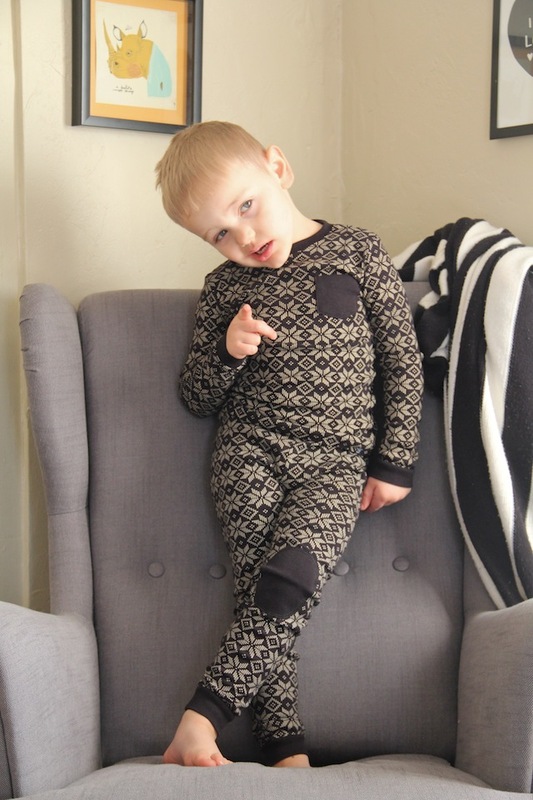 And something I recently learned about snug fitting pajamas for kids, you can order a few sizes up and they will fit for a lot longer! Thank you elastic ankles and wrists. You saved the day. I was a little hesitant to buy his PJs off of Ebay, but the quality is great! I am in love with the little leather knee and elbow patches. Over all we really love them and I can't wait to see him in them on Christmas morning!